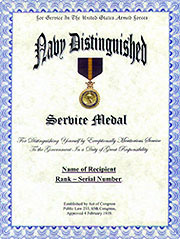 An unaltered photocopy of your DD-214, OR WD AGO 53-55, OR other military issued document clearly displaying your Distinguished Service Medal. Authorized on February 4, 1919, and amended on August 7, 1942. The medal is awarded to any member of the Armed Forces who, while serving with the United States Navy in any capacity, since April 6, 1917, distinguishes themselves by exceptionally meritorious service to the government in a duty of great responsibility. Awarded for combat or non-combat services. The Navy Distinguished Service Medal was established by Act of Congress (Public Law 253, 65th Congress), approved February 4, 1919. The Navy Distinguished Service Medal has been in effect since April 6, 1917. The Navy Distinguished Service Medal is worn after the Defense Distinguished Service Medal and before the Silver Star. Additional awards of the Navy Distinguished Service Medal are denoted by gold stars five-sixteenths of an inch in diameter. The Navy Distinguished Service Medal was designed by Paul Manship (1885-1966). The first person to receive the Navy Distinguished Service Medal was Brigadier General Charles A. Doyen, USMC, who received the medal posthumously on March 13, 1919. The central feature of the Navy Distinguished Service Medal is an American bald eagle with displayed wings in the center of a gilt-bronze medallion one and a quarter inches in diameter. The eagle holds an olive branch and arrows in its right and left talons, respectively. The eagle is surrounded by a blue enameled ring which contains the words, UNITED STATES NAVY, with NAVY centered at the bottom. Outside the blue enamel ring is a gold border consisting of scroll waves moving in a clockwise direction. The medal is suspended from its ribbon by a five-pointed star (point up) tipped with gold balls. In the center of the star is an anchor, and gold rays emanate from the re-entrant angles of the star. The basic theme of the obverse design is taken from the Army Distinguished Service Medal, which also has an eagle in the center and which is also surrounded by a blue enameled ring. The eagle is the American bald eagle and represents the United States, while the scroll waves allude to naval service (as does the star which suspends the medal). The olive branches and arrows in the eagles talons refer to distinguished service in either war or peace. The star used in the suspender stands for military service, and the anchor within the star indicates service performed on behalf of the Navy. In the center of a gilt-bronze medallion one and a quarter inches in diameter, a trident surrounded by a wreath of laurel. The wreath is in turn surrounded by a blue enamel ring which contains the inscription FOR DISTINGUISHED SERVICE. The blue enamel ring is surrounded by scroll waves of the same type found on the obverse of the medal. The trident symbolizes the authority of Poseidon, the Greek god of the sea who had the power to cause earthquakes (in Roman mythology Poseidon was called Neptune). The trident thus alludes to naval service, as do the scroll waves which surround the blue ring. The laurel wreath surrounding the trident represents achievement. 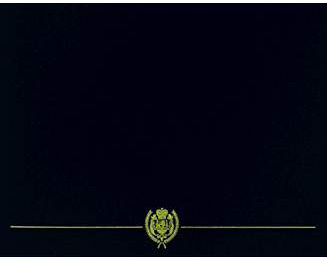 The ribbon to the Navy Distinguished Service Medal is a field of Navy blue with a center stripe of gold. These are the colors of the U.S. Navy. 6243 34 U.S.C. 355. Feb. 4, 1919, ch. 14, Sec. 2, 40 Stat. 1056; renumbered Sec. 3 and amended Aug. 7, 1942, ch. 551, Sec. 1, 56 Stat. 743. The word "award" is substituted for the word "present" to cover the determination of the recipient as well as the actual presenting of the decoration. The words "but not in the name of Congress" are omitted as surplusage, since a decoration is presented in the name of Congress only if Congress so directs. The words "Navy or the Marine Corps" are substituted for the words "Navy of the United States" because the provision is interpreted as authorizing the award of the medal to persons serving with the Marine Corps as well as with the Navy. The words "since the sixth day of April 1917 has distinguished" are omitted as executed. The words "United States" are substituted for the word "Government" for uniformity. 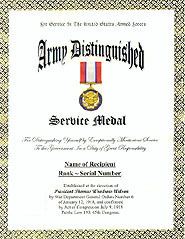 CROSSREF CROSS REFERENCES Award of distinguished-service medal to members of Army and Air Force, see sections 3743 and 8743 of this title. The Army Distinguished Service Medal was established at the direction of President Woodrow Wilson by War Department General Orders Number 6 of January 12, 1918, and confirmed (with minor modifications) by Act of Congress on July 9, 1918 (Public Law 193, 65th Congress). The Army Distinguished Service Medal has been in effect since April 6, 1917. Under certain circumstances the Army Distinguished Service Medal may also be awarded for services rendered prior to April 6, 1917 (see information provided under the Recognition of Merit). The Army Distinguished Service Medal may be awarded to any person who, while serving in any capacity with the United States Army, performs exceptionally meritorious service in a duty of great responsibility. The individual's performance must merit recognition for services which are clearly exceptional, and the performance of normal duties in an exceptional manner by itself will not justify an award of the Army Distinguished Service Medal. The Army Distinguished Service Medal is worn after the Defense Distinguished Service Medal and before the Silver Star. Additional awards of the Army Distinguished Service Medal are denoted by oak leaf clusters. The Army Distinguished Service Medal was designed by Captain Aymar E. Embury, III, and sculpted by Private Gaetano Cecere. -- General John J. Pershing, Commanding General, American Expeditionary Forces. In the center of a medallion one and a half inches in diameter, the coat of arms of the United States surrounded by a circle of dark blue enamel bearing the inscription, FOR DISTINGUISHED SERVICE MCMXVIII. The coat of arms of the United States is also used as the hat insignia by Army officers and therefore represents the United States in general and the Army in particular. A blank scroll upon a trophy of flags and arms. The ribbon consists of a central stripe of white edged with blue pinstripes and an outer band of red. The colors of the flag, they and are arranged in a configuration to keep this ribbon from being confused with others using the same color combination. 1. Description: The Coat of Arms of the United States in Gold surrounded by a circle of Dark Blue enamel, 1 = inches in diameter, bearing the inscription "FOR DISTINGUISHED SERVICE MCMXVIII". On the reverse is a scroll for the name of the recipient (which is to be engraved) upon a trophy of flags and weapons. The medal is suspended by a bar attached to the ribbon. 2. Ribbon: The ribbon is 1 3/8 inches wide and consists of the following stripes: 5/16 inch Scarlet 67111; 1/16 inch Ultramarine Blue 67118; 5/8 inch White 67101; 1/16 inch Ultramarine Blue; and 5/16 inch Scarlet. 3. Criteria: The Distinguished Service Medal is awarded to any person who, while serving in any capacity with the United States Army, has distinguished himself or herself by exceptionally meritorious service to the Government in a duty of great responsibility. The performance must be such as to merit recognition for service which is clearly exceptional. Exceptional performance of normal duty will not alone justify an award of this decoration. a. For service not related to actual war, the term "duty of a great responsibility" applies to a narrower range of positions, than in time of war, and requires evidence of conspicuously significant achievement. However, justification of the award may accrue by virtue of exceptionally meritorious service in a succession of high positions of great importance. b. Awards may be made to persons other than members of the Armed Forces of the United States for wartime services only, and then only under exceptional circumstances, with the express approval of the President in each case. a. Decoration (regular size): MIL-D-3943/7. NSN for decoration set: 8455-00-444-0007. NSN for replacement medal is 8455-00-246-3830.
b. Decoration (miniature size): MIL-D-3943/7. NSN 8455-00-996-5008.
c. Ribbon: MIL-R-11589/52. NSN 8455-00-252-9922.
d. Lapel Button (metal replica of ribbon bar): MIL-L-11484/4. NSN 8455-00-253-0809. 5. Background: a. The Distinguished Service Medal was authorized by Presidential Order dated January 2, 1918, and confirmed by Congress on July 9, 1918. It was announced by War Department General Order No. 6, January 12, 1918, with the following information concerning the medal: "A bronze medal of appropriate design and a ribbon to be worn in lieu thereof, to be awarded by the President to any person who, while serving in any capacity with the Army shall hereafter distinguish himself or herself, or who, since April 6, 1917, has distinguished himself or herself by exceptionally meritorious service to the Government in a duty of great responsibility in time of war or in connection with military operations against an armed enemy of the United States." The Act of Congress on July 9, 1918, recognized the need for different types and degrees of heroism and meritorious service and included such provisions for award criteria. The current statutory authorization for the Distinguished Service Medal is Title 10, United States Code, Section 3743.
b. Among the first awards of the Distinguished Service Medal for service in World War I, were those to the Commanding Officers of the Allied Armies: Marshals Foch and Joffre, General Petain of France, Field Marshal Haig of Great Britain, General Diaz of Italy, General Gillain of Belgium, and General Pershing. c. Order of precedence and wear of decorations is contained in Army Regulation 670-1. Policy for awards, approving authority, supply, and issue of decorations is contained in AR 600-8-22.